For as long as we’ve been in business, we have encouraged investors to adopt a patient, long-term approach to capturing the market’s expected returns. In industry parlance, some have categorized our approach as "passive," versus active attempts to beat the market. We prefer to think of ourselves as evidence-based . What if everyone were a passive investor? Wouldn’t the markets collapse? The question has resurfaced in a recent AllianceBernstein client note entitled "The Silent Road to Serfdom: Why Passive Investing is Worse Than Marxism." Its authors reportedly proposed that a "supposedly capitalist economy where the only investment is passive is worse than either a centrally planned economy or an economy with active market led capital management." If every investor embraced evidence-based investing, it is true that markets as we know them would cease to exist. But does that put passive investing on level with Marxism, or worse? Is passive investing "unfair" or bad for the economy? In "Indexing Is Capitalism at Its Best," AQR Capital Management’s Cliff Asness counteracts the presumption that passive investing is an enemy to free market economies: "[T]he use of price signals by those who played no role in setting them may be capitalism’s most important feature. … That most of us and most of our dollars don’t have to pick stocks, or to price air conditioners, is a great benefit and taking advantage of it makes us honest smart capitalists, not commissars." In other words, we arrive at relatively efficient "supply and demand" pricing in our capital markets the same way we do in any other market around the world. Whether it’s for stocks or socks, donuts or dollars, all it should take is a handful of active, engaged players to create relatively fair pricing that interested buyers and sellers can agree to. It’s also interesting to note that the players who object the most to allegedly free-loading passive investors are usually the same ones whose profits are being squeezed down by the market forces at work when passive investors avoid hyperactive trading costs. In his review of the note, Morningstar’s John Rekenthaler observed: "Whenever active investment managers write about indexing, the suspicion arises that they arrived at the conclusion first, then searched for their reasons later. This AllianceBernstein paper does nothing to change that view." How many active investors does it take to keep the markets chugging along? Bottom line, there is no definitive answer on how many active investors are required to set reasonable trading prices. In his ETF.com column, financial author Larry Swedroe explains that passive investors "receive all the benefits from the role that active managers play in making the financial markets efficient without having to pay their costs. In other words, while the prudent strategy is to be a passive investor, you don’t want everyone to draw that conclusion." Swedroe suggests that "at least 90% of the active management industry could disappear and the markets would remain highly efficient." Vanguard founder John Bogle (who launched the world’s first public index fund) also has estimated that a 90% passive market should be sustainable. Burton Malkiel, author of the classic, "A Random Walk Down Wall Street," has set the number even higher. "[W]hen indexing is 95 percent of the total, I might start to worry about that," he says in this podcast interview (at around 1:03:30). "But I think with indexing [at] 30 to 35 percent of the total, there is [sic] still plenty of active managers out there to make sure that information gets reflected quickly. And in fact I think it’ll always be the case." How plausible is it that we’ll reach a breaking point, with too many passive investors? Malkiel’s comments bring up another good point. Let’s say we’re wrong. What if, to remain relatively efficient, the markets need a lot more active players than we’re suggesting? We’re still not worried about it. Echoing Malkiel’s estimates, Swedroe observes of the U.S. markets: "Despite their growing share of the market (passive funds now control perhaps one-third of all assets under management), they still account for only a small percentage of trading activity. According to a Vanguard spokesman, on a typical day, only 5–10% of total trading volume comes from index funds." In other words, there are still plenty of active trades taking place for effective pricing, and there is good reason to believe that this necessary level of price-setting will persist indefinitely. Behavioral finance is alive and well. The study of behavioral finance informs us that investors are, after all, only human, and are often driven by chemically generated instincts and emotions that have nothing to do with solid evidence and rational decisions. We see examples of this every time investors chase the latest trend or flee real or perceived risk en masse. Behavioral traits such as herd mentality, recency and tracking-error regret take over, and are reflected in the market’s prices. 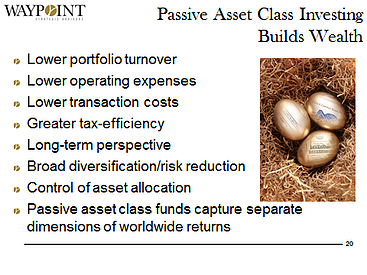 This is not passive investing; it’s active. And it appears to have remained highly pervasive, among individual and institutional investors alike. Capitalism is also alive and well. In their purest sense, "active" and "passive" investing represent opposite extremes on a vast spectrum of possibilities. A wholly passive investor would simply buy and hold the entire market and accept its returns. A fully active investor would always seek to trade profitably by forecasting future prices. In reality, most investors are neither fully passive nor fully active. They are often more one or more the other, especially when we consider global markets. This means we should expect price-setting participants to remain a substantial force in the markets … regardless of what we call them, and which label may be more prevalent. As Malkiel observes: "That’s the wonderful thing about capitalism. If you have free markets and somebody can jump into the markets if there is an opportunity, you can count on the fact that somebody will. … If in fact it was the case that markets were getting less and less efficient in reflecting information, believe me, there would be a profit motive for somebody to jump in." Where does that leave an evidence-based investor? To help us chart a sensible course in an environment where even our own instincts can steer us wrong, we turn to the best evidence we can find on how to effectively manage our money in markets that mostly set fair prices. Practically speaking, that evidence informs us that generating long-term returns calls for a patient approach, focused on managing the market risks involved, minimizing unnecessary costs, and avoiding the many behavioral traps that otherwise lead investors astray. If we can serve you by helping you invest according to these and similar principles – if we can serve your highest interests and personal financial goals – we believe you can expect that the capital markets will continue to serve you well, as well.